It is a simple play of words that fooled the Filipinos into believing that “Democracy is dead” when President Rodrigo Roa Duterte came into power. At every instance the Liberal Party and their supporters forge ways of vilifying and demonizing the DEMOCRATICALLY ELECTED President, but the question that they can’t answer is why do so? Well it is a simple matter of politics. Duterte isn’t yellow so bash and criticize him for their candidate lost. They are being a sore loser in other words. 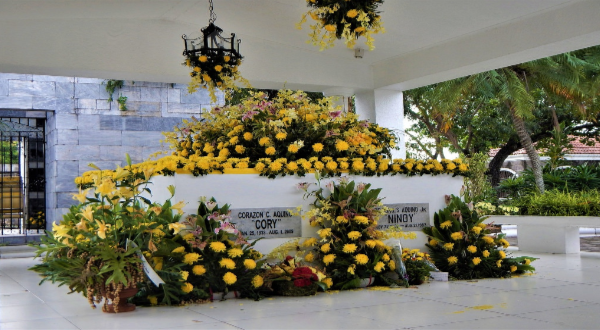 They even went to lengths of stating that “Democracy is dead” well the more they talk, the more people realize the fact that only Benigno Simeon “Ninoy” Aquino Jr and his wife late President Corazon “Cory” Aquino, the “icons of democracy”, are dead. How can one not be democratic if it was the people who voted for him. Duterte didn’t have anyone paid to vote him nor did he force people to vote for him under a gun at point blank. It was all democratic, purely democratic and the very essence of democracy. If the Liberal Party is fighting for democracy, then why are they fighting against a democratically elected President? If democracy truly is dead then wouldn’t the critics and rallyists against the President be silenced a long time ago? It is also saddening that these Liberalists would do anything to oust the President, even using the situation of the death of Kian delos Santos as propaganda. But did any of the Liberalist tried to visit the wake of Kian? No, but Duterte did out for he is aware of the effects of his actions. HE IS MORE HUMAN THAN ANY OF THE LIBERAL PARTY MEMBERS BY DOING SO. Vilify him yes, demonize him go one but never ever state that “democracy is dead” when you are able to do the two aforementioned deads that is bringing chaos to the Philippines. The only thing that is dead is democratic icons, Ninoy and Cory, the EDSA Revolution, the People Power’s efficiency and the once trusted and incorruptable surname Aquino. The LP’s decline is brought by their own doing. Caught by their own words and trapped withing the false ideas, propaganda and statements that are revealing their true demonic, not democratic, nature. Eventually the party will die and to hell will they burn for the sins that they’ve brought to the country may it be through graft and corruption, endangerment of children or the fake news that they so adamantely spread and actually started to deface honest and good-willed men like Duterte.